A truly original album, released at the height of (Post) Punk in 1978. An uncompromising and highly experimental work in a sea of Mod & Punk releases that year, it was not likely to be a mass market success. But older heads who were already heavily into Gong, Faust, Eno & Hawkwind found a hugely rewarding album here to add to their collections. Highly rhythmic and at times discordant the songs still manage to conjur up enough hooks to make them memorable and even hummable at times! The track NON ALIGMENT PACT is something of a classic as is THE MODERN DANCE, while LAUGHING is an excercise in deconstructive restraint and power. Jagged guitars, smashing bottles, insistant beats and singer Thomas' desperate wails make for - at times -difficult, but always compelling, listening. 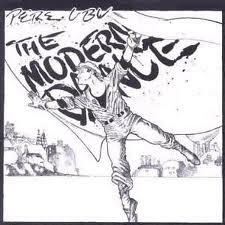 However, along with the LIVE IN CLEVELAND album & the DATAPANIK IN THE YEAR ZERO this record makes up a trio of great Pere Ubu 1970s platters.Issued in the UK on MERCURY RECORDS and on the much smaller BLANK label in the USA, it shows that Uk record companies were -at this point-hip enough to understand the relevance of this band and even expect a few sales. A cool album.